Stay connected 24/7, Superb HD 720P (Resolution of 1280x720) Video at 30fps. 3.6mm lens provides great field of view with wide 60 degree viewing angle. Quick and Easy Wi-Fi Setup via iOS or Android Device with Faleemi App, Stream Video Directly to Your Smartphone, Tablet, Apple Mac or Windows PC. Just download Faleemi App from App Store or Google Play, plug the camera in with included power supply (Note: the camera is NOT battery operated), then connect the camera to your router with included RJ45 cable, add the camera to Faleemi App, then view the camera with Faleemi App on your phone. Outdoor Metal Housing with IP66 Weatherproofing for Indoor/Outdoor Use - This weatherproof camera can be placed both indoors and outdoors (-10℉ to 120℉). 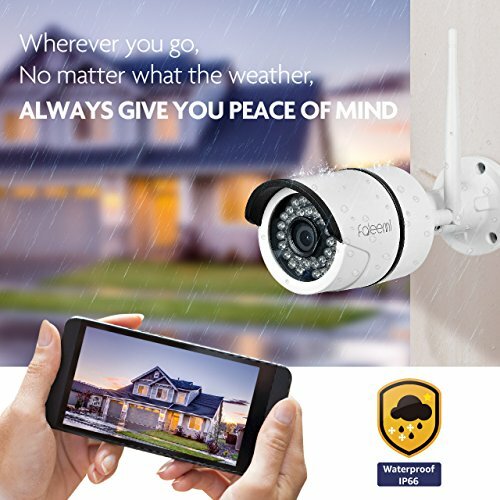 Protect your family no matter it is raining or snowing. See clearly in the dark with 36 Infrared LED - Night vision (up to 67 feet) lets you detect what's happening around the clock. Turn on/off night vision LEDs in the Faleemi App.